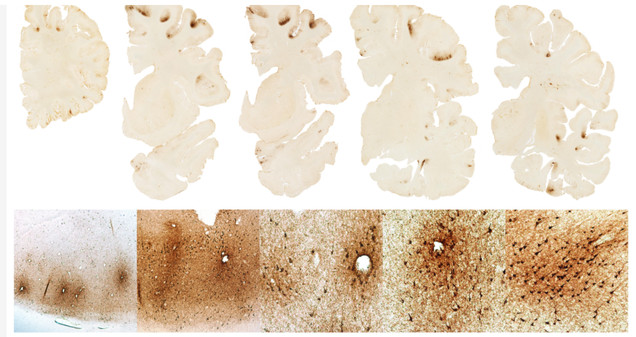 An autopsy of Hernandez' brain revealed Stage 3 CTE, reportedly the most severe case ever found in someone so young. His fiancee is apparently suing the Patriots and NFL on behalf of his daughter. Obviously the NFL has a major, major problem with CTE in their players. But on top of that, severe brain damage creates some thorny moral questions* about how personally culpable someone is for terrible behavior like Hernandez'. Just curious to hear people's thoughts about this. *Just to stem off any silliness, "let him get away with it" is not a valid answer to any of those questions. No doubt football played a role but I'm curious how much (if any), that hallucinogens would have on it also. Plenty of reports out there that he was using. Either way, this CTE thing won't be going away for the NFL. It's really really hard to pin down a single cause for someone being extraordinarily violent to the point of murder. But when you have a form of brain damage whose major symptoms include loss of impulse and emotional control...it's very hard to say it didn't at least change the odds of crossing those lines. And when that form of brain damage was almost certainly caused by the perpetrator's job, and they'd been denying and downplaying it for years, you have the potential for a major liability issue too. And beyond Hernandez' specific case, the NFL has a WWE-level tragedy unfolding with its athletes. And if they start finding this damage occurring in underage players and no good ways of preventing it, the whole sport could legitimately be done for in America. Does every player get a physical before the start of training camp? Are CTE scans part of that process? It can only be diagnosed post-mortem at this point, they need direct access to the tissue. Here's a pic of Hernandez' brain tissue they released. Literal holes in his brain. I wonder if the family of Odin Lloyd now has a case to sue the Patriots, NFL, and University of Florida because if CTE can cause suicidal episodes, couldn't they just as easily cause homicidal episodes? Going to be interesting to follow this story. the patriots, the university of Florida, and the nfl did not put a gun to anyone's head to play football. 3 years ago I gave the NFL 20 years before it is basically irrelevant (no longer a "big 4" sport). Im sticking with that timeline. In 17 years the MLS will be more popular. Sure, as long as they are properly educated from a young age about the major risks they are taking. Would any parent want their kid to play football if they properly understand what the risks are? The NFL has a major CTE problem, sure, but to me the bigger problem is for amateur sports, especially high school and the NCAA. I can justify following a sport that is essentially a blood sport when I know the players involved are making many, many times what they could ever hope to earn in a "normal" profession given their level of education and skills outside of that sport. There are lots of industries where workers agree to do heavy, dangerous labor for long hours week after week, inevitably resulting in their bodies failing at a young age, in exchange for a much larger paycheck than they would receive in a safer job with comparable educational and skill requirements. We as a society don't have a problem with those jobs existing. We don't mind the idea that a person might choose to sacrifice their own health in order to provide for their family. What about all of the players who are very serious about football from a young age up through their senior year of college, and never earn a single paycheck for playing? I suspect many of them end up with very significant CTE, even if it's not at the same level as guys who play in the NFL for 5, 10, 15 years. I feel that it is much harder to justify being a fan of amateur football, from a moral perspective, than it is to justify NFL fandom. Of course, the question that is raised by these findings with Hernandez is what liability should the NFL have toward the victims of players who commit violent acts which can likely be proven to be made possible at least in part by frequent head trauma? I would say the NFL needs to make sure they have a huge pool of funds set aside for settling such lawsuits. I imagine they do. I would guess they've had one for a long, long time.